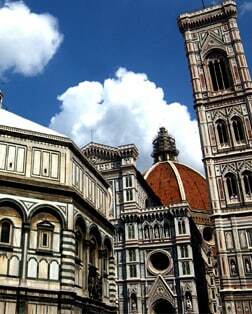 Brunelleschi engineered the innovative Gothic dome gracing the Cathedral of Santa Maria del Fiore. As for the stunning bronze doors of the Baptistery, Michelangelo dubbed them "the Gates of Paradise." Michelangelo's David is on display at the Academy of Fine Arts - the Accademia. Pisa's Campo dei Miracoli is home to the Duomo, Baptistery, Campo Santo, and the famous Leaning Tower which took over 177 years to build and has been leaning since construction began in 1173. Florence's most famous bridge looks as though it should have medieval blacksmiths instead of modern shops. In Piazza della Signoria you'll find a copy of the statue of David, and sculptures by Cellini. Significant in architecture and art, The Uffizi is one of the oldest and most famous museums of the Western world, rivaled only by the Louvre in its collection of Renaissance masterpieces. Legend is that Santa Croce was founded by St. Francis himself. The superb 14th century church is the final resting place of many noble Italians including Michelangelo, Machiavelli and Galileo. Tuscany has rolling slopes are covered with vineyards and silvery green olive groves, providing lots of wonderful photo opportunities with many quaint towns such as Lucca and San Gimignano. Greve in Chianti is the unofficial capital of the Chianti Region, the town came to prominence in the 13th and 14th centuries as a major trading center.